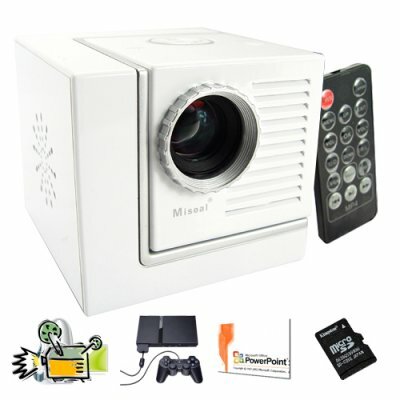 Successfully Added Pico Mini Projector Cube - Portable Multimedia Projector to your Shopping Cart. Pico mini projector cube with high brightness video output and resolution up to 800x600. A well-designed multimedia projector in a stylish cube format that combines superb portability with unrivaled ease of use for maximum user convenience when using this unit as a stationary or portable video projector. This Pico Mini Projector Cube has LCoS technology which offers an impressive image clarity with rich colors at projection distances from 30CM-300CM+ (1ft to 12ft and more!) with a bright, large screen size of more than 70 inches! 1) The business person who likes to hold meetings in his office. Who needs to go to company conference room when you can simply keep this mini projector on the corner of your desk and instantly turn it on when you need to share some big-sized ideas with someone else, all from the comfort of your desk. 2) The traveling salesperson who needs to make a big impression. Traditional LCD projectors are great but just not convenient, while most of today's new pocket sized projectors are simply not bright enough and often lack a VGA input. Well, the CVFZ-E08 has got you covered by being portable sized but at the same time powerful enough to give you a bright and clear image. 3) The game player or movie fan who does not have the space or money to buy a new 72 inch TV. Perfect to put on the bedroom nightstand or on top of your AV system cabinet, the CVFZ-E08 is a great way to put a big screen image on the wall of your bedroom so you can play some intense Resident Evil 5 or watch your favorite Simpson's episodes from the comfort of your bed. Installation is simplicity itself: you simply connect the multimedia projector directly to a desktop PC, notebook or netbook using a standard VGA cable. For home entertainment, it has AV input which means that you can also enjoy your favorite video entertainment devices and console gaming on a big screen right from the comfort of your own home couch or lounge chair. With the perfect combination of portability and image quality, this right-sized Pico Mini Projector Cube brings rich colors and vibrant image clarity to any presentation on a level that rivals much bigger units, but comes in a much more convenient form factor. A great wholesale price makes this unit perfect for any person or business that needs a new, ultra-convenient projector. Add it to your cart now to make your busy life a little easier and more convenient. On-board media player with a user-friendly interface. Simply insert a standard micro SD card (TF card) with your media into the memory card slot and navigate via the projected menu display. The handy media player is compatible with common audio and video file formats to provide you with an enjoyable media player you can use while in between business meetings or in your living room. Highly portable, lightweight mini multimedia projector that is ideal for the salesman who is often making professional presentations from place to place while traveling on the road. When used for home entertainment purposes this unit can also be connected to a huge range of standard A/V video sources such as the Wii, XBox family, PS family, MP3/MP4 players, DVD, DV cameras, etc.